A plaque on the war memorial commemorates those who lost their lives when an Avro Anson crashed near Biggenden on a return flight from operations in the Pacific in 1942 during World War Two. 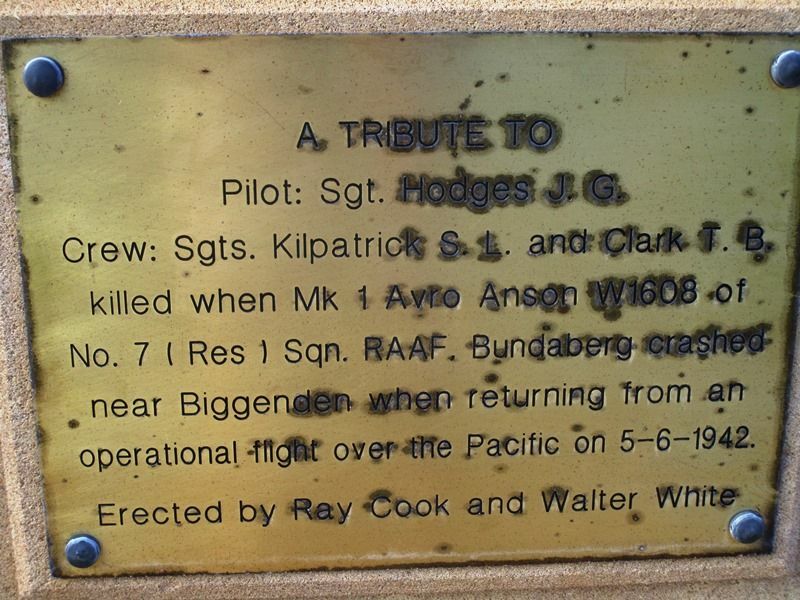 The tribute plaque, erected by Ray Cook and Walter White, was added to the memorial on Anzac Day 1993 and commemorates Pilot Sergeant Hodges and flight crew Sergeants Kilpatrick and Clark who died in the crash. Pilot : Sgt. Hodges J. G.
Crew : Sgts. Kilpatrick S. L. & Clark T. B.
operational flight over the Pacific on 5 - 6 - 1942.